Appropriate non-offensive attire, including shirts and shoes must be worn. Dress that is commonly recognized as gang-related is prohibited. Conduct that is disorderly, disruptive or which endangers others is prohibited. Such conduct may include running, use of skateboards, rollerblades, bicycles, radios, etc. The commission of any act as defined by Federal, State, local statute or ordinances as a criminal act is prohibited. 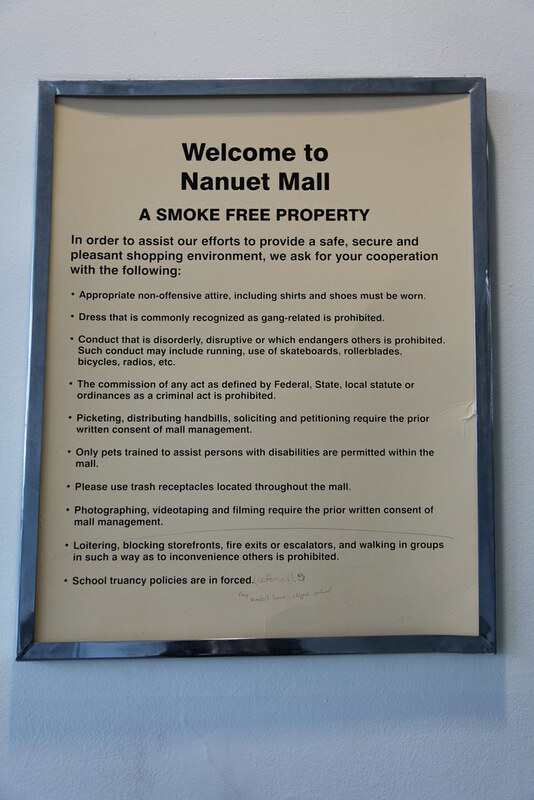 Picketing, distributing handbills, soliciting and petitioning require the prior written consent of mall management. Only pets trained to assist persons with disabilities are permitted within the mall. Please use trash receptacles located throughout the mall. Loitering, blocking storefronts, fire exits or escalators, and walking in groups in such a way as to inconvenience others is prohibited. School truancy policies are in forced. Under the typo in "truancy policies are 'in forced'" someone scribbed in pencil "(enforced)" and someone else wrote below that, "they shouldn't have skipped school."